Driving a vehicle and ruling the road is something that we all want to do. Irrespective of any age group we all love to drive our own car. But in this fast life where road is always bustling with traffic and speedy vehicle driving is no more an easy task to do; rather one need to be more cautious than ever before while driving on road. Road accident is something that happens in almost every hour, so safety of your own and also others on the road is a major concern while driving. Hence one can’t take driving as very simple thing to do. That is why, learning driving from a reputed, well equipped, high on technology with equally eligible instructor is important. Now when you are in search for the best driving center; your quest will definitely come to an end when you get introduced to refresher training courses at Dhoot Driving School Eltham, London. 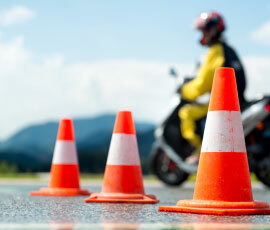 This institute is the best well recognized for their all types of unmatchable excellent driving courses. These courses are designed keeping all types of driver in mind, be it a young adult or who seeks to become a professional driver; all types of courses are there to fit everyone’s requirement. London is known for its multilingual culture, people from all over the world flew here to live, and not all of them are fluent in English. Dhoot Driving School institute is also aware of this and keeping this in mind they have programmed their training session not only in English but also in other different languages too. Their all instructor are fluent in other language and DCI authorized. So the learner doesn’t have to worry about not being able to understand the instruction properly. This one training institution made it a point that language can’t be a barrier when it comes to learning. Apart from providing the courses in different language they also provide different kind of driver CPC modules; few among those are driver CPC module 4 and 2. PCV Training: PCV license is for those who want to get into driving profession; this license is normally given to bus services. There are quite few types of PCV license available based on the types of bus and number of passengers one wants to ride. The various types of PCV driving license training provided by Dhoot Driving School centers are D, D1, D1 +E, D manual coach, D1 minibus, D automatic bus etc. Dhoot Driving School institute helps the individual to get this license smoothly. LGV/HGV training: This is one such training that is solely for those who wants to be professional driver and serious to move into automobile business. This LGV/HGV training largely cover license for heavy vehicles like truck, vehicle that weigh minimum 3.5 tons comes under the category of LGV license. Again these license has some sub-category like C1 – license, C1 + E license, C1 + E-7.5T +Trailer, C1 upto 32 tons etc. Driving heavy vehicle is much tougher than driving normal private car. You really need to be an expert driver to handle such heavy vehicle. 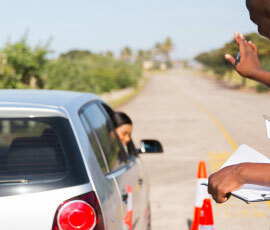 Dhoot Driving School institute has specialization in giving training for this particular license. This training is so systematically programmed that it starts teach the student with comparatively light-weight vehicle and gradually moves to heavy one just to build the confidence in driver which is one of the main requirement in driving heavy loaded vehicles. Driver CPC Training: Apart from all these above mentioned license EU has come up with another license CPC driver license. The full form of this license is Certificate of Professional Competence. This license is basically introduced to get more efficient and skilled drivers on road. It has been seen that drivers who drive heavy vehicles are not skilled enough to handle busy traffic and most of the time end up meeting with accident, so in order to make the road safer for both drivers and pedestrian this license recently got introduced. CPC training course in Dhoot Driving School provide a pact lesson that bound to enhance one driving skills. To get this license one needs to clear state CPC theory test and Dhoot Driving School module for this course is perfect for the drivers to hit the bull’s eye in the test to pass with flying colors. B +E Car and Trailer Training: This training is actually a combination of both heavy vehicle and trailers. In order to get this license drivers has to clear B +E practical test and also has to have B driving license beforehand. On completion of full training Dhoot Driving School center provide full service for you to get the license. All you need to do is to provide the legal documents like medical form, probationary form and rest they take care. They also make sure that you are ready for the license exam by continuously making you to go through mock exam. Apart from these things they also provide PCV Pass Protection service. To get more details about the services they provide and other details please contact Dhoot Driving School Eltham, London.